Why does it cost so much to ship a package? Shipping is calculated (by the shipping company or by the USPS) based on the distance we have to ship, the weight and size of the package, and the method you choose for shipping. We are in Burbank, CA so packages shipped to the east coast cost more to ship than those shipped to west coast locations. The longer you are willing to wait for your 'mallows, the less you will pay for shipping. So don't wait until the last minute to buy a gift :-) During the summer hot months, we may restrict shipping to air options and pack our orders to the best of our ability to keep them from melting down. Also, shipping companies have begun to adopt what's called "dimensional weight", which means that even if marshmallows are light, the packages are still charged as if they were heavier based on their size. You don't save any money by sending light packages! This depends on 3 things. While we do hold some inventory, our marshmallows are made fresh to ensure that you get the best, most delicious treats every time. 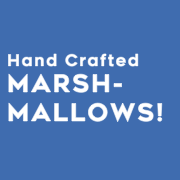 If we happen to be out of stock of an item you order, it may take a little extra time to make and package your marshmallows. If we are out of stock and it looks like it will take longer than 2-3 days to get your order ready, we make every effort to contact you to see if you would like to make a substitution or change your order. During periods of high demand, we increase our production but that might also have an effect on shipping time. The above estimated delivery times are only for the time that the package is in the hands of the shipper, and DOES NOT include the order processing time as described above. Once your package has shipped, you will receive an email letting you know your order has shipped and with any available tracking information.